The Abreaction Theater was established in 1979 as collaboration between Geoffrey King, a composer in Boston, and me, a visual artist in NY. To produce the theater we established Proleptic Productions, a 501-3-C not-for-profit foundation. 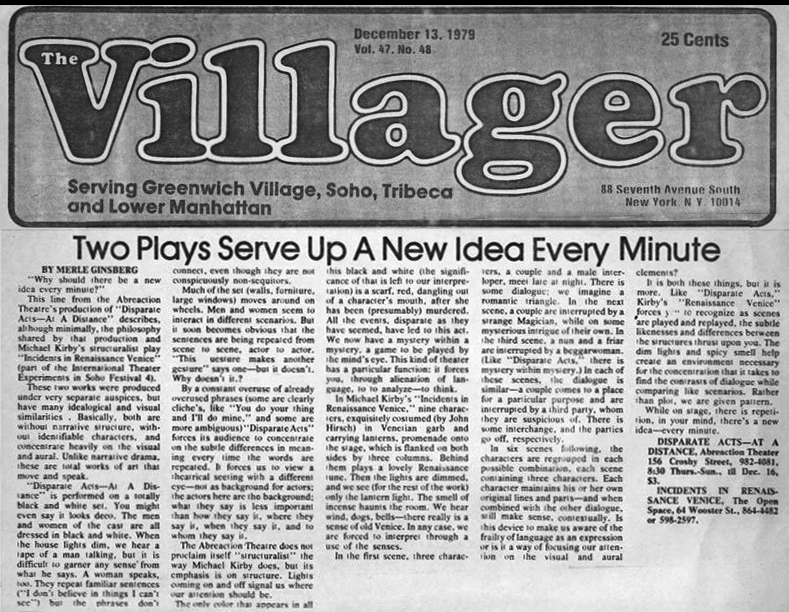 I had just finished working as a stage manager for the avant-garde playwright and director, Richard Foreman. The result of my experience with his Ontological-Hysteric Theatre was a script called Disparate Acts. Through a mutual friend, the script ended up in the hands of Geoffrey King who proceeded to accumulate musical ideas and references as he manipulated the text through recording sessions and at his editing table. 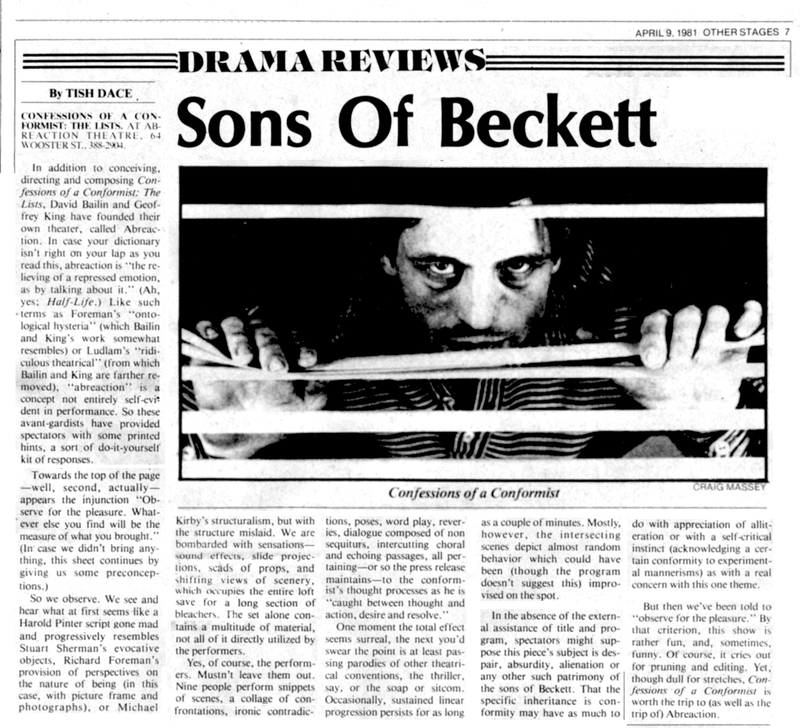 The success of Radio Sonata at its premier on May 4, 1979 at the New England Conservatory of Music in Boston convinced us both to create a theater focusing upon a unique fusion of acoustic and performance environments. By November, the Abreaction Theater presented Disparate Acts [At A Distance] in a small loft on Crosby Street in lower Manhattan. 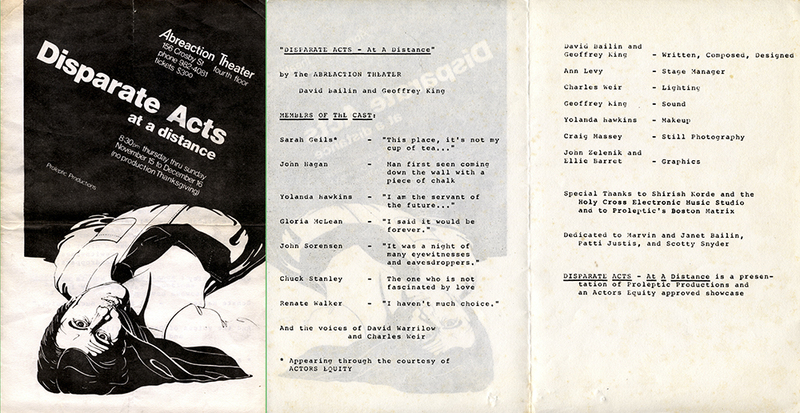 Confessions of A Conformist: The Lists followed in 1981 as the theater’s second production. 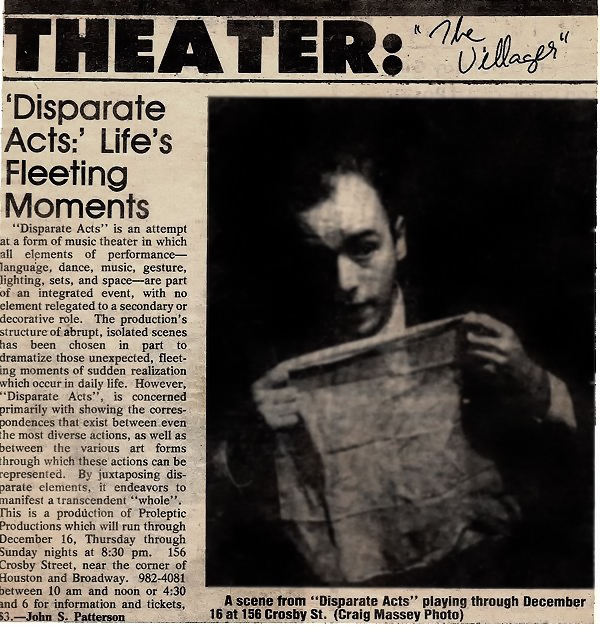 The last work was entitled Beginning Terrain and was staged at Squat Theater in 1983. DISPARATE ACTS: AT A DISTANCE was entirely in black and white and was performed in a theater measuring approximately 54 feet by 26 feet. The walls of the theater were painted black and the floor off-white. The set consisted of four stage flats: a wall, two windows with interior and exterior design, and a doorway. Each flat was 9 feet x 5 feet x 1½ feet and constructed of nine-sixteenth inch cardboard reinforced with furring strips and painted white. The furniture was constructed of identical materials and painted black. The men wore black suits, white shirts, black ties and shoes. The women wore white evening gowns. The lighting was specific rather than general and required precise blocking. A 2,000-watt rheostat dimmed 36 individually controlled (i.e., on/off) lights. Sixteen 600-800 watt rheostats controlled sixteen spots. The spots consisted of 75, 150, 200, and 300 watts. There was one floor fluorescent and two hand-held lights. The original Radio Sonata and other sound materials for the production consisted of two 2-track tapes operated according to a precise time schemata. Desired sound quality was obtained by placing the stage-rear speakers approximately two feet higher than stage front speakers. Channel 1 went into a stereo preamplifier with balance control to the loudspeakers left rear and right front; Channel 2, likewise over a second stereo preamplifier, went into the loudspeakers right rear and left front. Two additional speakers were placed stage right and were manipulated by the actors. The play ran seventy five minutes. The video taping of the production was an after thought. No one had worked with video before and it is obvious that the lighting (which we thought was adequate at the time) wasn’t bright enough to illuminate much of the play. That’s an understatement. Since at least a third of the play was actually performed in pitch black to create the acoustic environment we sought and scene transitions consisted of the actors moving the set on wheels over a wooden floor in that same darkness, it is amazing anything at all got on tape. It’s also obvious that the camera is not so much documenting the play as following it. Shot with now ancient reel-to-reel b&w video stock by one of the actress’ husbands without any direction by me, there was only one take. By the time I saw some of the playback through the eyepiece of the camera it was too late to call back the actors and I packed the three rolls away never intending to look at them again. I found only one place that could transfer this video stock into VHS format. Another ten years passed before I got around to transfer Disparate Acts [at a distance] to DVD and finally as a quicktime movie on the web. Watching the tape after nearly 27 years, I’m not as bothered by the loss of details as I was at the time of the filming. Frankly, I’m thrilled that this bit of 70s downtown theater has survived in any format. In 1978 I became Richard Foreman's stage manager for his Ontological-Hysteric Theatre production Madness And Tranquility: My Head Was A SledgeHammer. I had seen Rhoda in Potatoland and felt I had seen the most complete and satisfying work of art in my life. I went to his studio a week later and offered to work for him. My audition was to create a doctor's examination tool using a flashlight as the base. After a couple of weeks of balancing my Master's course load, a graveyard shift UPS truck loader and a five hour stint in the theater at night, I asked to go full time and get a small stipend. In return, I would drop out of school (ironically, taking an incomplete in a directing course taught by legendary stage director, Harold Clurman), quit UPS and work exclusively for the Theatre. Foreman taught me everything about directing, about creative thinking, about translating script to stage, lighting and sound.... and while getting to my loft early in the morning, I’d spend several hours working on my own script Disparate Acts. It was lucky that at the same time Foreman decided to close the production to concentrate on his film, I finished my script and contacted his actors to begin staging mine. There are plots, and bombs, and lies. 1. A PLAZA: the monument in whose shadow they are standing, the grid of some gigantic game of tic/tac/toe. The caption: The isolated pawn is a very complex factor. 2. PATIO DINNER: (with the family) multiple exposures of private parts in public places, extra limbs and digits, and two additional dinner guests. The caption: There will be others later. 3. PLEIN AIR: birds in the trees, a desk littered with pieces of incriminating documents urging the naming of names, a layer of forgotten memoranda, phone numbers, unanswered letters, tattered sheets of carbon paper. The caption: The background of a decision. 4. BETWEEN EMISSION & ABSORPTION: a large format photograph of a polaroid, of a life-size painting of a couple on a sofa in front of a mirror. The caption: An exchange of tokens of appreciation. 5. P0SING FOR A PHOTOGRAPH: (on the lawn of an estate) close-up of a rose, displaying the wounds (self-inflicted or otherwise) of a personal stigmata, slight blurring around the edges, the wind blows. The caption: Identification is masked by environmental factors. 1. CONSIDER THE CASE OF SUICIDE: business failure, unhappy love, physical illness, lost hope. 2. CONSIDER ADDING YEARS TO LIFE: correcting the minor defects, toning the muscles, relaxing the mind, letting off steam, establishing a pattern of life. 3. CONSIDER IF THERE IS NOTHING TO BE SAID ON THE SUB!JECT: that too is interesting, and the irony is not lost. The audience is left with that irony as well. The play ran 120 minutes. "Heart on the left, pocketbook on the right."